Now that it’s just the ZMan and I at home, I’m trying to cut back on the amount of food that I cook. I still want to cook enough to have leftover for lunches and perhaps to freeze a second meal for later use, which makes dinner time a breeze. In combination with that I’m also trying to cut back on the amount of electricity we use. Not only because we are facing “another” rate increase in May, but because I’d rather keep as much of our money as we can, and it’s the right thing to do. Another form of waste I’m trying to cut out. These two efforts have led me to use my toaster oven more instead of my conventional oven. It uses less energy, and smaller meals are by design a requirement. The problem was I only had the one baking pan that came with the small oven, that was really getting a work out and limiting me to what I could cook. Then I came across these smaller cast iron pans. You can see them on top of the toaster oven. First let me tell you I love to cook in cast iron cookware. I love that it will go from stove to oven and that they will literally last forever. I even use my cast iron on top of the wood stove to cook. Finding these little babies has allowed me to really open up the meal options while still using the toaster oven. 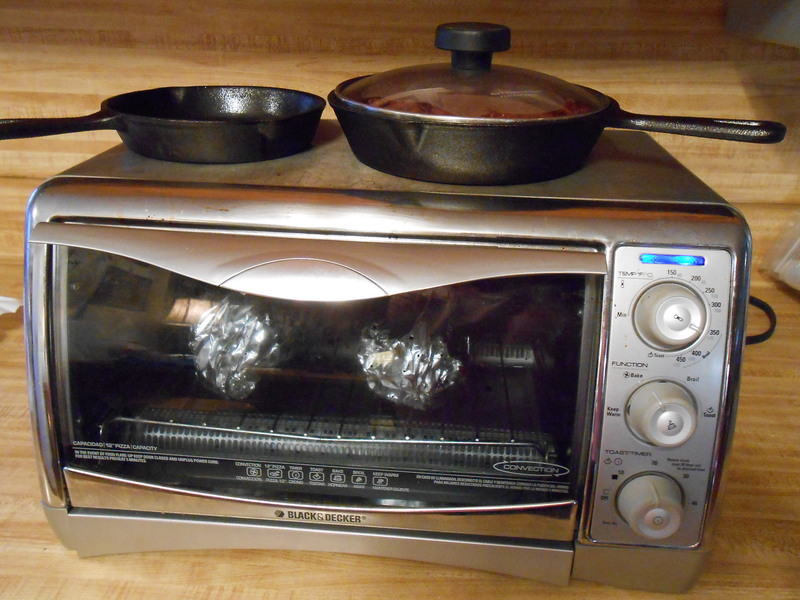 The toaster oven gets warm enough that I can even heat a side dishes on the top of it. I love that (pardon the pun) the switch has flipped and I am always trying to think of ways to cut back and save, instead of just tossing it out, cutting it on, or buying a new one. I’ll admit it does take quite a bit of planning, but thinking about a process instead of just jumping into it always works out best doesn’t it. Kind of like the measure twice and cut once theory. Sure, I still have my impulse times that I shoot from the hip and make a stupid purchase, but they are a lot less frequent now which is allowing the hopes and dreams jar get a little more full. Are you thinking of ways to cut back or perhaps to off set the electric company increase that’s coming? I’d love to know what your ideas are. Posted on April 7, 2014 by LoriPosted in Saving, WasteTagged Saving, Waste. Previous Previous post: Friday Fun… Oh My!